I knew I was different when my friends started to mock my inability to stay away from the grocery store, even on vacation. I was baffled. You mean not everyone savors the sights and sounds of a produce section? You don't get a thrill at discovering a new kind of bread in the bakery? You don't look forward to the daily ritual of making dinner, the weekend treat of baking a new dessert? Cooking is one of my favorite things, so naturally, the grocery store is one of my favorite places. And don't even get me started on the farmer's market. Heads of dewy lettuce, glossy zucchini stacked in pyramids, tomatoes in every hue, powder blue eggs, chunks of glowing honey still in the comb, bison sausage sticks and rounds of cheddar-garlic bread? Swoon. Food. It's a bit of a passion for me. With this possibly geeky admission, I'm kicking off a new feature here at Love Well: Foodie Friday. I'm insecure about labeling myself a foodie, because I'm not a creative cook. There will be no new recipes unveiled on my blog (unless you count little tweaks here and there), and I don't cook like I'm having Andrew Zimmern for dinner. But I do love the art of cooking, and I am an enthusiastic convert to the philosophy of real food, and I cannot go out to dinner without saying, at least once, "Wow, this is really good! Taste this!" This is my chance to say the same to you. A few weeks ago, when Natalie was in the throes of her birthday sleepover extravaganza, I posted this picture on my Facebook page. Once you have about 4-6 cups of popcorn, sort through and remove the old maids as best you can. (Did you know that's what unpopped kernels are called?) Normally, those duds just languish in the bottom of the bowl. But when you pour melted marshmallows over popcorn, which you are about to do, they will get caught up in the sticky romance of the situation and lurk in a tasty glob, just waiting to chip a tooth. Once it's throughly mixed, add in the crumbs of 2 crushed graham crackers and as many chocolate chips as you deem necessary. I used mini chocolate chips, so they would melt faster and not fall to the bottom. (Or, for an adult version, throw in some chunks of dark chocolate.) (Wow. I wish I hadn't thought of that.) Stir to combine and serve to the oohs and aahhs of your friends. Cinnamon toast popcorn. Melt 3 tablespoons of butter with 3 tablespoons of brown sugar. 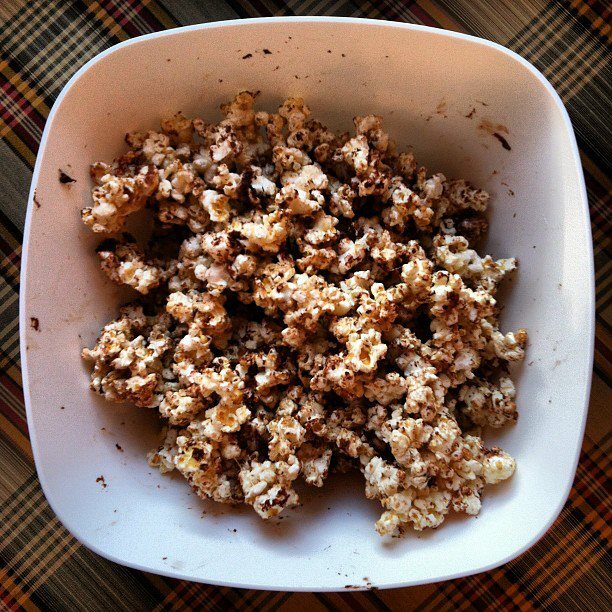 Toss with popcorn and then sprinkle with cinnamon. Cheesy popcorn. Melt 3 tablespoons of butter and toss with popcorn. Top with 1/4 cup of finely grated Parmesan. Add fresh cracked pepper to kick it up a notch. THIS SOUNDS DELISH! Make some for me, mkay?! Love this idea! Especially because I can make a "Carrie's Version" (gluten free) with some of her graham-type crackers and she has a new treat. And the other versions you mention could be adapted for her as well. Thanks, Kelly. My mother still considers that a legitimate meal, and delights in using it on my children. "Grandma Mary made us popcorn for lunch!"